We spent a delightful day with Peter and highly recommend him as a guide as well as our tour. The day was well planned to avoid crowds and traffic. His knowledge of the area was enlightening as well as his willingness to share a bit about life in Australia. Terrific! Peter was absolutely wonderful, knowledgeable and flexible with our group of 10! We diverted to a great wildlife sanctuary, followed by a wonderful lunch & tour in the Yarra Valley wine region. The wine tastings were excellent and Peter could not have been more accommodating! He got us to a Harley Davidson store on the way to the ship - much appreciated by the group! We all agree, Peter was a great choice!!! Long lovely day, Peter was the best!!! Peter is a delightful guide, as authentically Australian as it's possible to be. He has travelled the globe, but it is obvious that he is proud of Melbourne and its vitality. His four-hour tour of the city takes in most of the sights, made all the more interesting with Peter's flowing narrative, lovely sense of humor and Ozian eye for human frailty. We highly recommend him and his tour. Peter was a great host for our day trip to Healesville and the Yarra Valley. He accommodated the items I wanted to add to the itinerary, while really rounded out the day. We learned about the various animals unique to Australia at Healesville, then had a wonderful traditional Australian lunch of pies at local bakery. We finished out the day visiting three unique wineries that gave us a perfect tasting experience. All around, a great day within 1 hour of Melbourne CBD! This was a long, productive and enjoyable day. We highly recommend Peter. Peter was a great tour guide. He had everything all planned and he was very organized. He showed us some beautiful, amazing country up in the rain forest and an incredible animal sanctuary that let us be up close to kangaroos, koala bears etc. Everything was absolutely beautiful and we would highly recommend Peter for anyone wanting to tour authentic Australia. Our guide Peter catered cheerfully and efficiently to our wish to maximize time in Yarra area plus a quick drive-through of the city... we preferred to skip visiting a winery and have a quick lunch at a local cafe. Thank you, Peter, for a great tour. Peter is a knowledgeable, skilled driver, always pleasant in spite of frequent roadwork, in a day long driving tour! His insight offered a view of the Great Ocean Road with fewer fellow tourists and tour buses. The historical background as well as the current economic situation shared by Peter offered a rich perspective for our 10 hour tour. We saw amazing natural features, lighthouse, and towns. His good humor and positive approach helped us view koala, kangaroo, and many varieties of birds up close. Tour was well planned and above expectations. Peter was very knowledgeable, friendly and accommodating. He took us to a fabulous local bakery for lunch where we had scallop pie for the first time! All in all, it was a great experience and would recommend this tour to anyone! I give Peter J a rating of 5 out of 5. He took us on a long tour of the Great Ocean Road and was so good -- professional, knowledgeable and so much fun to be with. We had a great time on this trip -- he even went the extra mile to show us some places to eat and visit in the city. I can't thank him enough for making our vacation so wonderful!! Peter is was great tour guide. He knew were to go to avoid the crowds. The places he took us were amazing. I would recommend him for this tour to the great ocean road. Peter was a wonderful tour guide. Peter knew some wonderful places to go and we discovered some other boutique wineries together. He also took us to a very nice restaurant for lunch. Peter's car was very comfortable and clean. I would definitely use Peter again. Peter was a wonderful tour guide. He is very knowledgeable of the area and took us to several extra places to ensure we saw koala bears and kangaroos. Peter's car was very clean and comfortable and the SUV provided large windows for great viewing along the Great Ocean Road. I would definitely use Peter again. Peter was a genial host and it was a pleasure to have an extended conversation with a local conversant on a wide range of issues. He also was helpful in accommodating our dietary preferences. A private tour is a relatively expensive option (for us) but it proved to be a good value. Peter was a wealth of knowledge about Melbourne, its history and that of the surrounding area as well as a good representative for what w think of when Australia comes to mind. The highlight of our day with him was the trip to the gold mine. We still were talking about it several days later. Excellent tour. Peter was great in pointing out things as we went and allowing time for photography. Peter was a very nice man and I give him 4 stars. He took us to the the war memorial which was on a beautiful hill over looking the city. We also went to this shopping market which was huge. We also went to a Jewish museum which we found interesting. We went to federation square and it was packed with people. A fair of some kind was going on. We also saw the beach houses. We had a very fun day. Peter was knowledgeable about the city and took us to the things we wanted to see. Outstanding guide, very knowledgeable and accommodating. Would "highly reccomend Peter"
Really enjoyed our tour with Peter. He was very informative about Melbourne past and present. He worked hard to maximize our time so we were able to tour Melbourne and travel to Phillip Island to finish our tour with the Penguin Parade. Highly recommend Peter and this tour! We had a wonderful day with Peter. He is charming and fun to be with. The tour was informative and we had a great penguin experience. We definitely will tell our friends about the excellent tour. Good guide...very knowledgeable. tour was enhanced by guides knowledge of living in Melbourne. it consisted of driving and walking which made it more unique. Peter did a fantastic job of leading our family if 5 (2 adults & 3 teens) on a full day of adventure to Phillips Island. He met us at our rental apartment, and the Mercedes van was clean and comfortable, Peter was good natured, very knowledgeable and did a great job of keeping us on track with a full day of activities. We took in an eco-boat tour, a koala reserve, and a sunset drive to spot wallabies before penguin watching. Peter was so great we just booked a 2nd day with him to see the great ocean road! As mentioned in the rating for our other tour with Peter, we had an excellent 2 days with Peter and saw an amazing amount of the beautiful sights around Melbourne. Penguins on parade, koalas, wallabies, kangaroos, etc. Peter made every effort to assure that we saw these unique Australian animals. Peter is a great guide... easy to be with for 2 full days, completely flexible. We certainly recommend Peter and will contact him again when we next visit Melbourne. We spent two full days with Peter exploring Philip Island and the penguin parade and saw koalas, wallabies & echidna. The penguin parade is certainly worth the trip. On day 2 we saw the beautiful Great Ocean Road, the 12 Apostles and more koalas and kangaroos. The rain forest in Otway Nat. Park was gorgeous. Peter is an excellent guide with a great knowledge of the the area & all of the sites we visited. He went out of his way to make sure we saw as many of the animals unique to Australia as possible. We had a great day with Peter. He has a very easy personality and was a delight as a guide. We highly recommend this tour. It was worthwhile to have the upgraded tickets to Shelley Beach (Cat Cove) with a private ranger and a handful of other tourists to view the penguins. We received an overview in the ranger office, protective gear, night vision goggles, audio support, a ranger ride to the beach area, and a coupon for a drink before Peter drove us back to Melbourne in two hours. It was superb to skip the chocolate factory and visit Cranbourne Botanical Garden and Caldermeade Dairy Farm. The koala park is a bonus. Amazing! Peter was a wonderful tour guide and we had a beautiful day! He is prompt and professional. It was the guide's suggestion that we head first to the ocean so we could avoid the afternoon crowds. He suggested simple refreshment breaks so we conserved our time for the sights. There was no time for the lighthouse. He did encourage us to take the helicopter ride over the Loch Ard Gorge, London Bridge, and the Twelve Apostles. It was excellent for the money. We spotted kangaroos and an emu on the drive back to Melbourne. He kindly parked so we could photograph the event. TOUR GUIDE RESPONSE: Two Fantastic two days on the Great Ocean Road & Phillip Island Penguin Parade. Stay safe and thanks for touring with Peter J.
Peter was very flexible with the agenda and worked to customize the tour for me. I was happy to be able to visit a sheep farm that was not on the original agenda. Great day. I guess it is not easy to arrange a tour for a group who has someone who needs wheelchair access and some seniors but peter did a good job of it. thank you! Peter was a great host & guide for our full day tour of the Great Ocean Road. He was very personable & very knowledgeable. He took us off the main road to visit a rain forest as well as areas where we could see kangaroos, koalas & native birds in the wild (AMAZING)! He knew how to get us to the sights before the big tour busses, which made for a much more enjoyable experience. I would recommend Peter for this tour or any other for that matter. Great service, very kind and landscape was just exceptional. I really love Ocean Drive ride and 12 Apostoles. Excellent knowledge of locale and drive. Able to respond completely to requests during the tour. Very patient and supportive when looking for koala bears. Trip and the Great Ocean Road were very spectacular. If you have the time, take this trip. Wonderful tour for all 13 in our group! LOVED the optional helicopter ride to see the 12 Apostles and gorgeous coastline from the air. Our guide Peter was friendly, quite knowledgable, and most accommodating to all of our sightseeing requests. We highly recommend this tour!!!!! Peter did a great job of showing us Melbourne. Only recommendation for change is to do the city first and then the sanctuary as city sites were more important to the group. Due to inclement weather we reversed the order but end of day traffic almost wrecked havoc with the city plans. Peter stayed with us until all sites on the itinerary were viewed. Peter was very pleasant and professional. We had a lovely day. Although a long drive to the 12 apostles, it was definitely worth it. I would recommend it. TOUR GUIDE RESPONSE: Thank you Diane, it was a pleasure having you aboard. Absolutely wonderful tour,. The driver was fantastic and we opted for the ultimate penguin experience at Phillip Island. 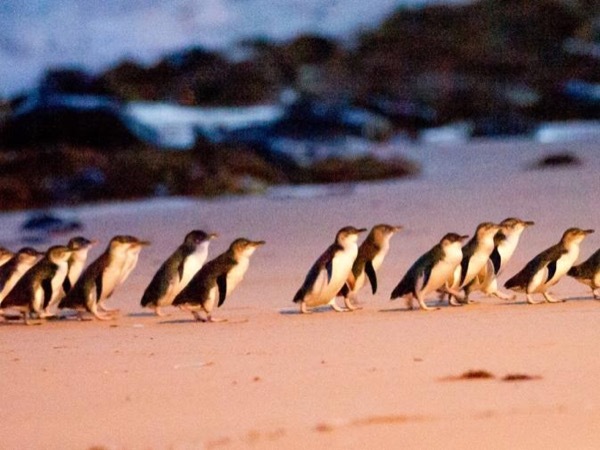 WOW a walk with the little penguins.. Definety worth the extra cost. Peter is a very friendly, easy going, tour guide. Peter was an excellent guide, very knowledgeable and accommodating to our small group. He didn't rush us at all and never seemed concerned if we took too long at a particular sight. Our day with Peter was a terrific one. He was extremely knowledgeable but very friendly and flexible. We visited the Healesville Santuary in the morning to see the kangaroos and went to a winery in the afternoon. A top quality guide and a top quality day. Outstanding trip. Peter customized the trip to the desires and needs of our group, providing us with the most memorable experience for this natural wonder. At the end of what was a long day he gave us a quick tour of Melbourne with great suggestions on what to do and see with the single day we had left in the area. As always we were extremely happy with our "Tours by Local" excursion. Highly recommend Peter J. This was absolutely amazing. The Penguins were stunning to watch. The guide was very well organized and knew everything we wanted to know about. Good driver too! This is an "almost excellent" tour. Peter is very well informed and the tour is well planned and timed. The koala conservatory is great; fun dinner in town, Parade of Penguins is a must see for all travelers. Absolutley fabulous. The only not so great part is a very small, poorly designed chocolate factory tour. Waste of time and money. It is an expensive trip, but the penguin parade makes it worth it. Plan to have 4-6 people to share the cost.